For me it always seems the days after the end of the World Series are filled with deafening silence. The season is officially over and the long winter stretches out before us like an endless plain. In some ways it's a relief when the Rangers struggle, next year is that much closer. In other ways it's like taking the first step away from base camp on a thousand mile trek across the silent tundra. The sound of the 2014 season is fading already and 2015 is still so far away. I miss baseball already. To the Royals fans out there: I'm sorry, truly I am. I was pulling for the boys in blue up until the final out of Game 7. It won't help the disappointment but they played well. Seven games and a one run loss in the final game are nothing to sneeze at. The team looks solid and should be a contender over the next couple of years. Just remember, there's 28 other teams out there that would trade places with the Royals today in a heartbeat. The off-season for the Rangers is moving slowly along. 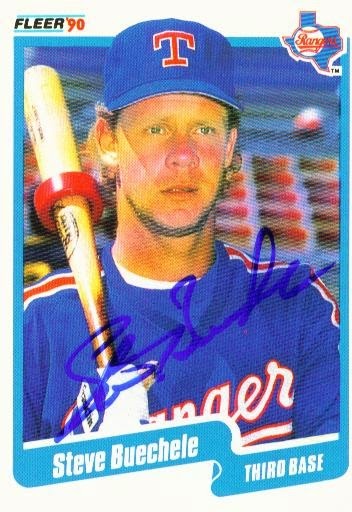 They promoted Steve Buechele, shown here on a signed 1990 Fleer card, to bench coach. Bu replaces the departed Tim Bogar and has to be viewed as a possible managerial candidate for the Rangers, or someone else, in the future. Can't say how great it is to see Steve succeeding in his post-playing career. Texas also made an opening offer to Colby Lewis. That's a good thing I think. No need to leave Colby hanging any longer than need be. He wants to stay in Texas and the Rangers need starting pitching. Lewis is not an ace but he is an established Major League pitcher who knows how to win and can eat innings. He can also mentor a young staff and help steady a team in contention. Those things could come in real handy in 2015. Lewis has said he does not want to draw out contract talks. That could mean a relatively short negotiation. The silent time is why being a college football fan is fun! If that happened here in Boston...trust me, it's far better to finish last than lose the World Series. I love baseball, but this time of year is awesome for college sports. My Mountaineers play TCU this weekend and college basketball starts next week! By the time the basketball season is winding down pitchers and catchers are reporting.